Boy pictured going WD/BOW at the Sunflower Kennel Club of Olathe show. Boy is a son of our "Buddie", Ch House of Tucks Buddie. He is out of our Ch House of Tucks Mrs. Cox, "Sissy". 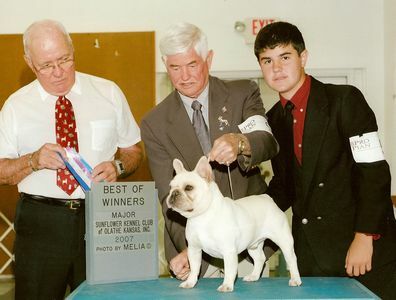 Copyright © 2005 - 2010 House Of Tucks French Bulldogs, Doherty Kennels & JLS Canine Services Web Design.